I’ve been riding my bike around a lot lately, though I haven’t been writing about it. My bike is just my everyday, as it’s been, the way I get from here to there and back again. School started last week, so that means the commute is back, down to the shuttle stop, a ride the rest of the way, and then reverse. On Friday I took my bike with me on the shuttle–love that front bike rack–so I could ride the whole way home, a quick stop at the casino for some payday action, a leisurely ride back home via the Gwynns Falls Trail. It’s almost fall riding season, and I can’t wait for the days when it isn’t a total sweat-fest just to ride over to the park. Saturday’s ride was particularly leisurely, a slow roll down to Mount Vernon to meet N. for a long lunch and some afternoon beers on her patio, listening to city traffic and swapping rat stories. I decided to push the bike up the hill for a bit on my way home and watched the neighborhoods change, the many people living their separate lives in this same place. It was time for the early evening show at the Charles, and I watched the many older white folks file in for date night, just two blocks away from the Y-Not Lot, already blasting TT the Artist to the slowly gathering crowd of much younger folks, Black and white, amidst others selling their wares on the sidewalk, as they do every weekend along North Avenue. I’m guessing these several crowds rarely overlap, a reminder that in order to remember that not everyone is living in the same world as you are, you have to pay attention as you move through space, look outside of your yourself and your cell phone. 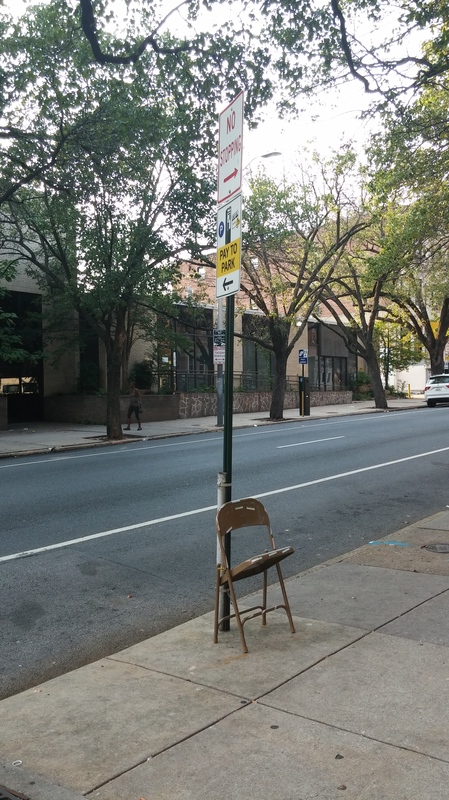 And then it was time to pedal, so I did, stopping just a couple blocks later to take a picture of this folding chair locked to a sign. This is clearly someone’s seat, and they’re keeping it–public space made private, or just made more comfortably public–anybody can sit down here, I suppose. And then I was home again, home again, another day where getting there and back’s made better by bike. This entry was posted in personal and tagged Baltimore, Charles Village, Mount Vernon, Station North, TT the Artist, Y Knot Lot. Bookmark the permalink.